With the Christmas season in full swing and families looking for art projects to do with their kids, NatureKids BC encourages families to consider eco-friendly alternatives to glitter this year. Microplastics are a growing problem for marine ecosystems as glitter enter the ocean from rivers via household wastewater and run-off from landfill sites, thereby putting wildlife and marine organisms at risk. Some estimates place the number of microplastic particles in the world’s ocean at up to 51 trillion fragments in total and glitter is part of the problem. 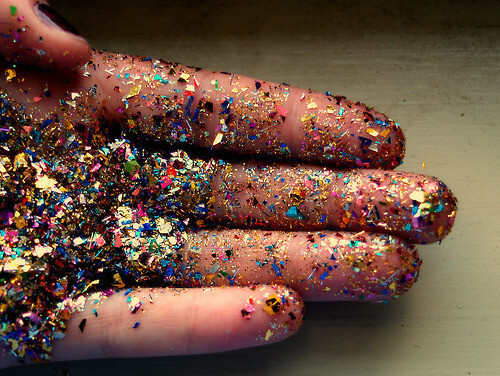 And the glitter that doesn’t end up causing harm to wildlife ends up in landfills. Due to its plastic and foil properties, glitter has no recycling potential and has been known to clog up recycling machinery. So glitter-covered wrapping paper and cards are only destined for the garbage, causing an unnecessary contribution to landfill sites. No Replies to "Not All that Glitters is Gold for Wildlife"